The “Great Gatsby curve” debate, on the link between income inequality and intergenerational mobility, had gone stale – but now Bhashkar Mazumder has given it a new lease of life by focusing on skill gaps, rather than money gaps. 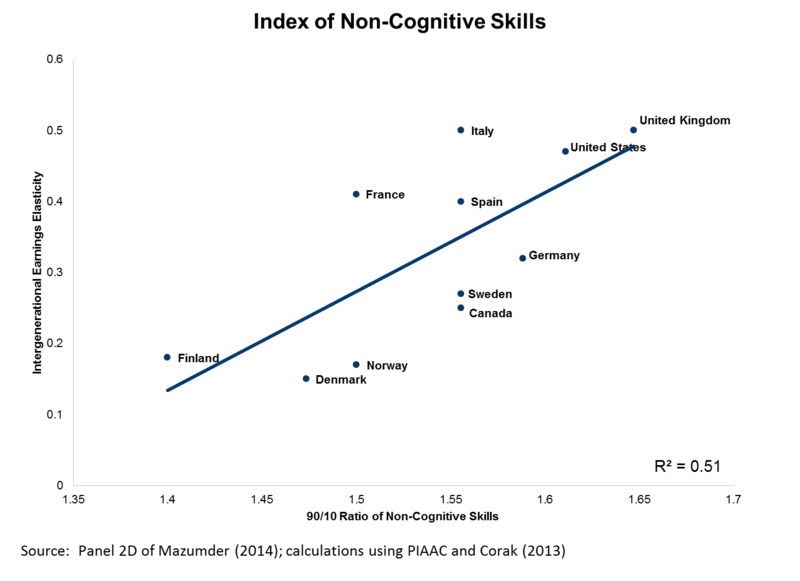 In a new Chicago Fed Letter, Mazumder examines the relationship between mobility and inequality in skills, as measured by the Programme for the International Assessment of Adult Competencies (PIAAC) survey, conducted by the Organisation for Economic Co-operation and Development (OECD). He gauges skill gaps in numeracy, literacy, problem-solving ability and non-cognitive skills, with the ratio between the 10th and 90th percentiles on the distributions. These gaps are then compared to mobility, measured by intergenerational earnings elasticity, across a range of countries. Of course, there are a host of other factors influencing both inequalities in skills and intergenerational earnings elasticity – Mazumder mentions demographics, neighborhood characteristics and national institutions – so a correlation is a very long way from causation. But examining gaps in skills rather than in income seems like the right way to take the Great Gatsby intuition. And it is striking that gaps in character skills seem to matter more than gaps in math and reading. If we are serious about improving opportunity, we will have to take seriously the inequalities in formation of character strengths, as well as those in more academic skills.